A cabinet table saw is not just another tool in a woodworking shop, it is the centerpiece. It is an excellent machine for a professional contractor or a hobbyist with a small shop. A cabinet table saw is built to be robust and durable, for heavy duty construction and efficient dust collection. In appearance, they may look similar to the cabinet enclosed hybrid saws, but they are much more powerful. Table saws are big machines and usually cost a few thousand of dollars. Imagine purchasing a table saw for $1000 for smaller projects in your workshop. After a year or so, business develops and you start receiving large contracts that will bring much revenue. Your business success is right over the edge but Houston, we have a problem! Your table saw is small and certainly not fit for bigger projects. Sadly you have invested in a small table saw and now you need to spend another $3000 on a bigger one, you are regretting you hadn’t done more research. When it comes to investing in a cabinet table saw, you want the best table for your money. From the table top, fence, miter slot, arbor, and blade, to the strength, durability, energy efficiency, and safety, you have to consider the best combination of all. 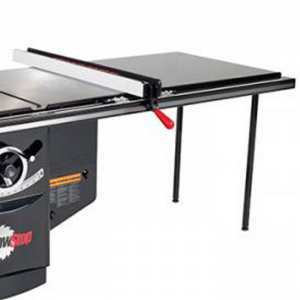 Here is the Home’N’Roll review of the best cabinet table saw for you to buy in 2019. In addition to the buyer’s guide, we will discuss the performance, features, and safety of each table saw to help you choose the best one. What Should You Pay Attention To When Buying Best Cabinet Table Saw? A table saw has been very popular among the wood contractors and has also evolved steadily over time. A cabinet saw is stationary equipment and is well suited for high-precision and high-speed woodwork jobs. There are some special cabinet saw features that are tailored to specific applications. It provides you with reliable and accurate results, is extremely fast and efficient, has optimal quality blades, and provides enough workspace for safe cutting. It is suitable for large workspaces and professional woodworking. With all these excellent features comes the higher cost of buying a cabinet saw. We have outlined the most important points below, which you should consider before buying a cabinet table saw. Most cabinet table saws will run on a 240 volt supply. The Higher the horsepower, the more voltage your machine will need. It is very important to understand how much juice your machine can handle. Cabinet saws that are powered by a 1.5HP – 2HP motor can easily run on a regular 120V circuit. These saws can typically handle a 2-inch thick board easily and result in accurate cutting. For thicker or harder wood, consider a 3HP – 5HP table saw which require a 240V circuit. This may require you to upgrade your current 120V installation. These big boys are robust and powerful, which also raises the question of self-safety while handling such machines. If you overwork a saw, the edge of the saw may get damaged or the saw blade can get misaligned. In the worst case, you could burnout the motor. Simply put, cabinet saws are heavy machines weighing over 500 pounds. They entirely enclose the motor and their heavier weight helps in dampening excessive vibration. A heavier table saw will be able to cut more precisely. Larger tables offer more space for working with the material. Some tables may need extension or roller stands to process longer boards. Larger tables may not require an extension at all but are heavier in weight. You should have enough space for your cabinet table saw in your workshop. Consider the size of the wood you are going to work with and whether you have enough room to process it, before purchasing your table saw. A cabinet saw is an ultra-precision high speed machine that consumes and emits a lot of power. The quality of the saws cabinet body must be good to survive heavy weight as well as the force of operation. 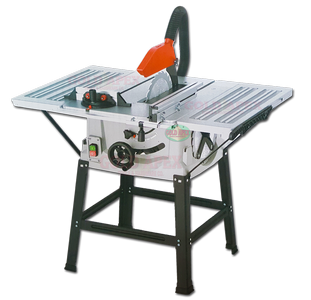 Generally, cabinet saws are made of cast iron, steel, or aluminum. Aluminum is a light metal which is becoming popular with automobile manufacturers as they need to be lighter in weight to gain acceleration and speed. 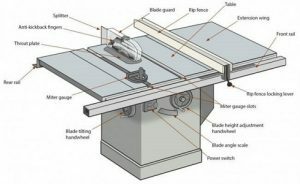 In the case of a cabinet table saw, aluminum does offer a light-weight body but may not be a good choice while cutting or ripping heavy wooden blocks. On the other hand, there are steel cabinets that are stronger in compression to aluminum. Cast iron is even more resilient and durable. It can last much longer than any other cabinet material. However, cast iron cabinets are costlier and add to the overall weight of the machine. Sometimes the hobbyist builder often forgets the actual function of the cabinet table saw: the sawing. For it to perform its primary function, you need a high quality saw blade. Saw blades with numerous small teeth are suitable for chip-free edges but they tend to overheat quickly. Most cabinet saw manufacturers include a saw blade with the unit. Still, there are many that come without a blade and you should confirm before making a purchasing decision. The saw blade should be adjustable up to 45°, which makes it easier to cut accurately. The saw blade is usually height-adjustable. There are different criteria such as blade diameter (pay attention to the outer and inner radius), thicknesses, and the teeth material of a blade. Carbide saw blades are made up of a steel body and soldered carbide teeth. It is considered stronger than a Chrome Vanadium blade. However, a Carbide blade is costlier than the CV blade. It is advised to not compromise an a saw blade as disposable part that needs a regular change. Changing a saw blade should be easy and not require any tools. In fact, a good blade assembly doesn’t require unscrewing anything at all. While professionals know their way with tools and blades, working with blades is always dangerous, especially when you have to perform a complicated process to assemble them. The T-fence is an essential part of your cabinet table saw and you should not purchase one without it. It is usually made of strong steel as it deals with a lot of wear and tear. Make sure the fence lock down is reliable and appears straight. A proper fence facilitates accurate cuts with increased precision and offers minimum deflection. As you already know, safety comes first and you should not neglect security when buying your own table saw. To start with, a saw table without a blade guard is simply not an option. It prevents the saw blade from hurling debris and kicking back the material to the operator. An emergency stop button is required for these tools and should be easily accessible. You should be able to hit the emergency stop with your knee, foot or any free body part. The riving knife is one of the really indispensable safety precautions on a table saw. It is a thin bent piece of metal that is mounted behind the saw blade, which prevents kickback. 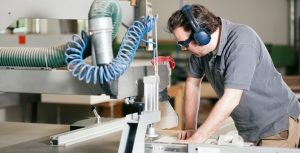 Safety equipment with a table saw will add to the cost of the machine. However, we can all agree that every penny is worth it when our fingers or limbs are at stake. Unless you have never operated a cabinet table saw, you will agree on how important a dust port is. 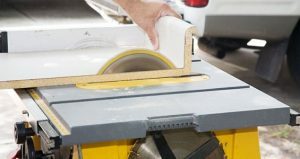 Dust-free work is particularly important and you should pay attention to the possibility of connecting a dust port. Most good quality cabinet saws come with an attached dust port. 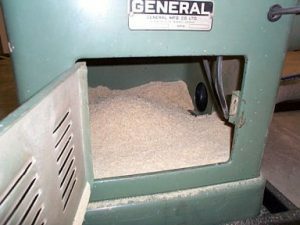 The advantage of using a dust port is that you always have a clear view of the material as sawdust is immediately sucked away. It prevents dust from flying into the eyes and nose, preventing health hazards. The CDC has classified sawdust as a carcinogen. A dust port is highly recommended for a professional who works on table saws often. Contractor Saw vs Cabinet Saw - What is the difference? 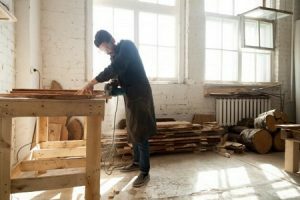 A table saw, such as the Porter Cable contractor table saw, is a good choice for a DIY hobbyist who wants to cut, rip, or model thin pieces of wood (3” or smaller). It is not fair to say that a contractor saw cannot cut bigger material, however, if you decide to make such a decision, be aware that the blades will suffer consequences and the table saw can burn out in the long run. 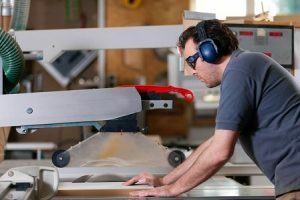 A contractor table saw generates less power and has higher vibrations than cabinet saws. It offers both reliability and versatility for different types of woodworkers who generally do not perform heavy duty work. Moreover, it occupies less space than a cabinet saw. Meanwhile, a cabinet table saw is a monster! It is high-speed, extremely powerful, accurate, and a highly durable machine, engineered especially for professionals. It is very heavy, thus offers lower vibration. Cabinet saws run on 240V and have higher horsepower that is required to cut through any type of wood. 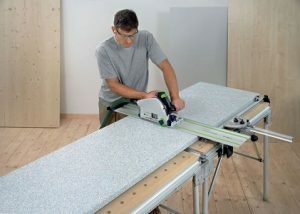 It offers accuracy in the cutting process and collects almost all the dust inside the saws cabinet. Cast iron made cabinet saws are much stronger than any table saw available in the market. Of course, this super strength and high-accuracy comes at a higher cost. The SawStop Cabinet Saw PCS31230 is engineered for professional woodworkers as they can count on its patented safety system. It is a heavy-weight table saw unlike any in the market, with the thickest arbors and 3.0 horsepower that cuts like a dream. SawStop introduced a 52″ T-Glide Fence System that provides smooth and precise operation, an expansive workspace, and a SawStop safety system lockdown that works in milliseconds. SawStop has dedicated countless engineering hours to ensure the finest quality and performance. The SawStop table saw is ideal for both craftsmen and hobbyists. Its electronic accident prevention system can stop the blade in 1/200thof a second after it detects skin contact with the blade. This is one of the best cabinet table saws for durability, high-speed, and marked precision.The safety it provides is worth every penny. Here is a well-engineered cabinet table saw designed with ultimate precision for quality and performance. Made up of long-lasting and durable cast iron material, this table saw has a powerful 5HP motor to provide reliable performance for years. Although there are no particular safety mechanisms, its anti-kickback system is quite impressive. It ensures a dust free environment with its 4” port for dust collection. The Delta 10” table saw has a large table top to allow professionals enough space for their crafts. The Delta 10 inch table saw is designed for professionals who cut wood for hours at a time. It is recommended for those who give time and quality a preference over the price. This cabinet table saw is best for handling thicker material with precision and accuracy, also for beginners who prefer easy assembly and setup to get started. The Jet XACTA® Deluxe table saw offers more power than you will ever need! Jet introduced a left tilt trunnion that makes board cutting stable and easier while protecting the motor from any sawdust at the same time. The Jet cabinet saw is powered by a 5HP motor which means there is no wood this beast cannot handle. Its 50 inch fence and large table surface allow professionals to work around a variety of models. Also, it offers safety features like a riving knife to prevent kickback. Jet 10 table saw is a perfect machine for professionals who are looking for a sturdy cabinet table saw with plenty of power. It makes excellent cuts with precision and control. This professional cabinet table saw is high-quality woodworking equipment that will not disappoint those who upgrade from a Jet contractor table saw. Price history for Delta 3 HP Motor 10 in. UNISAW with 52 in. BIESEMEYER Fence System. Delta 10 inch table saws are high quality wood processing machinery with excellent stability and accuracy. Their cast iron body is promising and lasts for decades. 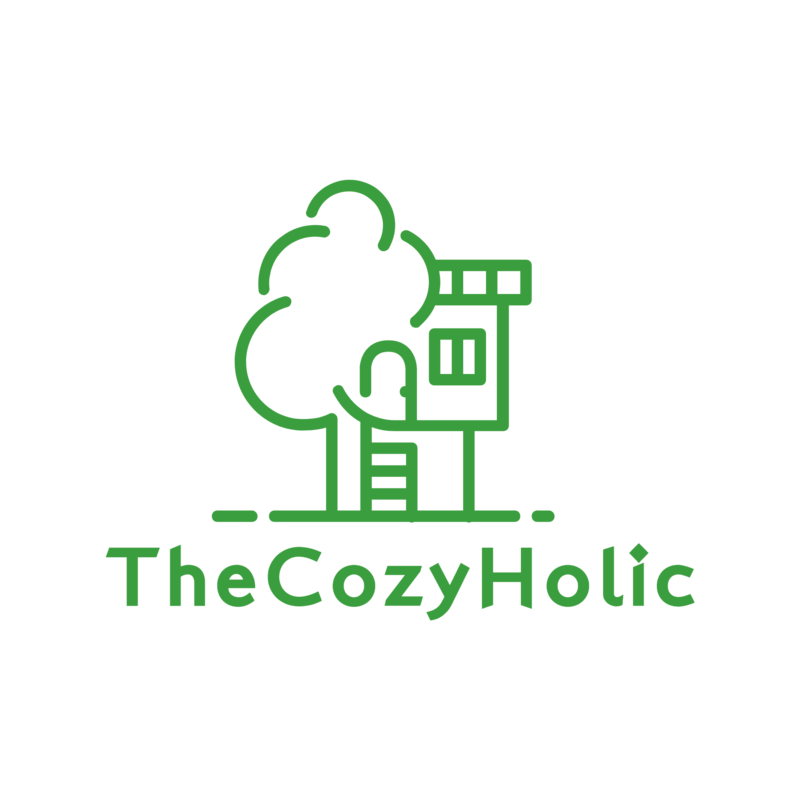 Their 52 inch fence system is strong and has no issues other than minor design related ones. Delta 36-L352 table saw is powered with an American Marathon 3HP motor that ensures maximum power for hours of performance. Its sturdy cast-iron base offers stability. Its push-button arbor lock allows easy blade adjustment. The Delta UniSaw is ideal for professional woodworkers who want accuracy in their work without compromising on tabletop workspace. This cabinet table saw is best for achieving accurate cuts with precision and comes with ample motor power that will never let you down. The Powermatic PM2000 is one of the best cabinet table saws that is innovatively designed with excellent features built to support professional woodworkers. It offers a vibration-less heavy cast iron body and impressive machinery design. It offers a wide stance heavy-duty trunnion for better stability and blade adjustment. Powermatic designed Industrial Accu-Fence systems to ensure precision and accuracy in the cuts. The Powermatic PM2000 is an award winning cabinet table saw recommended for those who want the best of design, strength, and accuracy. This Powermatic cabinet table saw is an ultimate performance beast with a precision-based design and durability. For those who cut through a lot of plywood, this cabinet saw is the perfect tool. As a hobby woodworker, you will be impressed with the Grizzly’s price and features. You can assemble and set up the machine in 3 hours. The Grizzly table saw is powered by a 3HP motor that can provide enough strength to cut through any wood. Everything from its cast-iron body to its extension tables, fence system, rigid base, etc, is designed to achieve accuracy in cutting. One cannot go wrong with the Grizzly G0691 saw. It is recommended for both hobbyist and professional woodworkers but we suggest buying an additional stronger blade. This cabinet table saw is best for those who prefer easy assembly and uncomplicated blade and riving knife changes. The Dewalt Job Site compact cabinet table saw offers you the portability and convenience of setting up the saw anywhere in your workshop. Use it to cut through 2 inches of hardwood or rip floor planks. The industrial engineering leader Dewalt ensures you will experience more than you expect. It is powered by a 15-amp high torque motor that will cut 2.25″ at 45° with ease. The Dewalt DWE7490x is ideal for cutting lumber, hardwood trimming, ripping sheets, and finish. It is a powerful and compact table saw, one that is a delight to have in your workshop. This is the best cabinet table saw under $1000. It is portable, easy to set up, offers accuracy, and a larger ripping capacity than its peers. For a professional wood contractor, this Shop Fox table saw is an extra-ordinary heavy-duty machine. If you want accuracy, strength, and durability, then this 3HP powered saw is the best choice for you. It is powerful enough to cut through any wood, yet delicate to be accurate and precise at the same time. The tabletop is large, the cabinet body is sturdy, dust collection is excellent, and the price is reasonable. What more could you ask for? Although this saw manufacturer is relatively new in the market, the Shop Fox W1819 is a sturdy and impeccable table saw for a carpenter, hobbyist or a professional woodworker. This is the best table saw for the money, ideal for those who do not want to compromise over motor power and rip capacity. What is the best cabinet table saw? For hobbyists and professionals, a table saw is indispensable as it carries out countless crafts over time. Since it is not something you are going to change every season, it is important to consider whether the saw’s features and functions suit your particular requirement. Choosing the right one can be a daunting task, especially since many machines offer similar features and are available in different models by multiple brands. This is what our best cabinet table saw review aims to help you with. Some of the main features you would want to consider include a powerful motor, durable body, easily adjustable blade and fence, large rip capacity, and most importantly, the safety features. The Delta Table Saw 36-L552 Unisaw is probably the best cabinet table saw as it offers a powerful 5HP motor with a large 52 inch fence and a large table top. Its ultra-strong cast-iron body will last for decades to come. It is highly accurate and has an incredible miter gauge.